How to break the cold front, clear the fog and change the extended outlook of your marriage. What's the forecast for your marriage? Marriages are as variable as the weather, and every marriage has a climate. Some are chilly and lack intimacy. Others are stormy and filled with conflict. But while the weather outdoors is beyond our control, the communication climates wihtin our homes can be changed - for the better. - Publisher What's the forecast for your marriage? Marriages are as variable as the weather, and every marriage has a climate. Some are chilly and lack intimacy. Others are stormy and filled with conflict. But while the weather outdoors is beyond our control, the communication climates within our homes can be changed - for the better. Without a healthy climate of trust, we are prone to miscommunication and misunderstanding. Our individual words and actions take place within an overall atmosphere of expectations. Muelhoff shows how to take an accurate climate reading of a relationship and explains what causes poor communication. With research on marital communication, listening skills, empathy and conflict resolution, Marriage Forecasting provides practical ways for couples to rebuild a warm relational climate. What's the forecast for your marriage? Marriages are as variable as the weather, and every marriage has a climate. Some are chilly and lack intimacy. Others are stormy and filled with conflict. But while the weather outdoors is beyond our control, the communication climates within our homes can be changed - for the better. Without a healthy climate of trust, we are prone to miscommunication and misunderstanding. Our individual words and actions take place within an overall atmosphere of expectations. 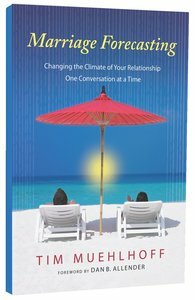 Muelhoff shows how to take an accurate climate reading of a relationship and explains what causes poor communication. With research on marital communication, listening skills, empathy and conflict resolution, Marriage Forecasting provides practical ways for couples to rebuild a warm relational climate.